It was late afternoon, the time of day I make my 2nd trip down to the chicken pen to feed my three birds a 2nd time. It had been raining, torrentially, off and on all day, but I decided to get my attitude straight as I put on my long German cloak and rubber boots. Those things, along with my large pale blue umbrella, kept my clothes perfectly dry, and I was happy to feel the wind and mist against my face. Breathing deeply of the purest air, there was nothing going to bring me down on my afternoon jaunt to the chickens. Opening the door of the coop, there they were, all wet and happy. It surprised me when I first observed years ago that chickens like to stay out in the rain, scratching in the mud to find that last little worm or bug. They some tough ladies ! As soon as I opened the door, they scooted out into their yard thinking I would be throwing the sunflower seeds and cracked corn out there in the puddles. However, today my new plan on this rainy day was to keep the food in the coop. So I poured it clanging against the side of the metal feeder, hoping they would hear the noise and come running back in to eat. That way I could then close their little hatchway door and they would be in for the night, earlier than usual. Unfortunately, chickens are just like children. They don’t want to come inside until it is nearly dark, and trying to force them in is practically impossible without a lot of squawking. Patiently I leaned against the door jam, and waited. One came in, Ma Belle, but she didn’t stay long. Darn, I thought, it is pouring out there, the food is in here, and still they play. I did not fancy having to come back down again by dark, in the rain, putting all my stuff back on again so as not to get wet, being more chicken than my chickens ! And so I waited, calling to them in a high pitched, chicken-like voice, but they refused to walk up their little plank and into the nice dry coop. Then it struck me. I was waiting on the chickens, in more ways than one, and I do this everyday, twice a day ! I am their dedicated waitress. I bring them leftovers from breakfast , lunch and dinner, things like cold oatmeal, apple cores, rice and beans, greens, chicken bones from the rotisserie, just about everything their little hearts desire…except the brussels sprouts. The other day I put several little cooked brussels into a hollowed out cantaloupe half, and all they ate was the cantaloupe, leaving a very thin rind. Somehow I didn’t think they would care for the b.s. any more than most people, but this was only an experiment, so I was not surprised or upset. Most children don’t like brussels sprouts anyway. I eat them because they are good for me and I am one of those rare individuals who actually likes them. Children and chickens, on the other hand, are not so easily convinced ! Back to waiting on the chickens. I had the revelation about my servitude position while waiting for the chickens to come in out of the rain, but then I grew tired of waiting. Going out into the yard with them, I nonchalantly and very slowly, went around behind them and gently shooed them in the direction of the ramp. Happily it did not turn into a fiasco, with no success, as it frequently has in the past. Likely they were considering going in anyway. 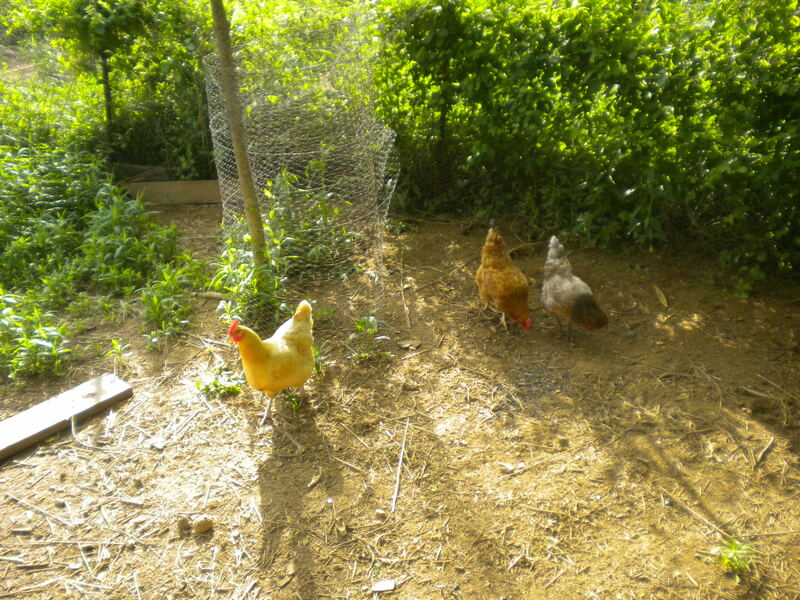 Or perhaps it registered in their little brains that there was no food in the yard, so it must be inside the coop. Whatever they were thinking, or not thinking as the case may be, they all ran quickly, squawking as they ran, up the tiny ramp. Quickly, I closed the little door, saying “gotcha ! “ Whew, that was easy, I thought. Thank God, as it was beginning to pour down rain again, and I was getting hungry. All wet and happy, the three little imps began to discover the food in the dispenser, and I was happy too. I said “Goodnight girls, thank you so much girls for your eggs.” (I always thank them) and then “see you tomorrow”, as I closed the main door. Whoever said captive birds aren’t happy ? They are no more imprisoned than I am. We might as well be happy together. I don’t mind waiting on the chickens. I serve then and they serve me. 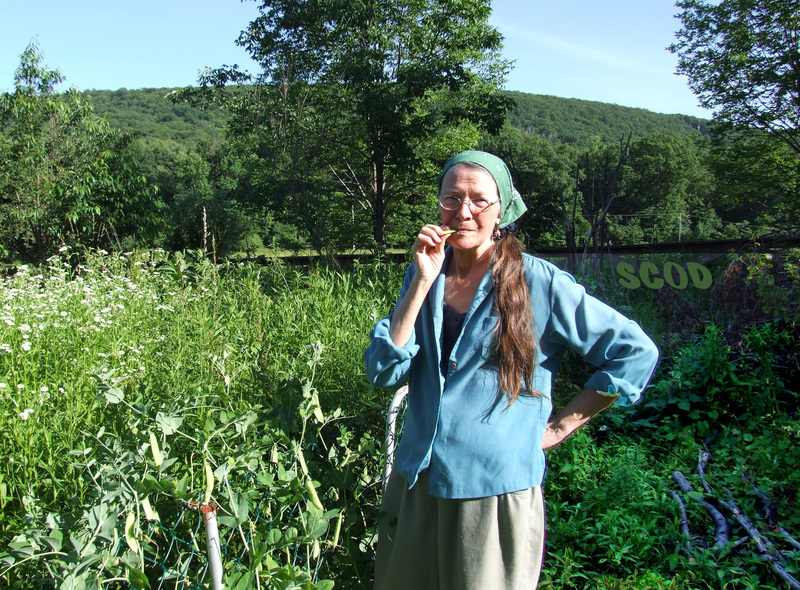 Their large brown eggs are the best, and their manure helps my organic gardens to flourish. Plus, everyday they give me a reason to get outside one more time, rain or shine, and take a walk down the hill, sometimes wading through wet grasses with the feel of mist on my face. I might even have a little adventure besides.